Back in 1998, I went to see a film at the cinema called π. To be honest, it was fairly dreadful, so I would not recommend watching the whole film. However, take a look at this snippet from the trailer. I like the comment that “mathematics is the language of nature”, and you will see that more and more as you study different areas of maths. 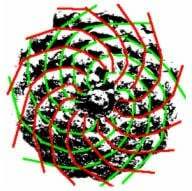 For example, take a look at this image of the bottom of a pine cone you will see mathematical spirals. There are green spirals going in one direction and red spirals going in the opposite direction. 1.1. How many green spirals are there? 1.2. How many red spirals are there? These numbers come from a sequence in which you add the previous two numbers to get the next number, e.g, 1 + 1 = 2, then 1 + 2 = 3, then 2 + 3 = 5, and so on. The sunflower below also has two sets of spirals, and the numbers of spirals are also part of this number series. 1.4. 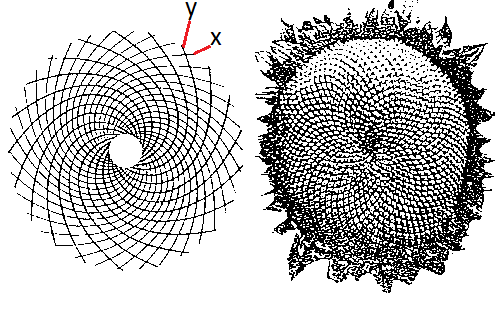 How many anticlockwise (x) spirals? 1.5. How many clockwise (y) spirals?